In this recording, you'll learn a wealth of high-impact techniques that cut across diagnostic lines and apply universally, from early childhood to young adult. Using these techniques will enable you to accomplish quickly what can often be missed in months of regular talk therapies, counseling or behavior modification reward systems. You’ll learn how to stop pre-delinquent clients’ manipulations such as victim playing, power struggling, denial, minimizing, defiance, evasive lying, excuse making, blaming, and justifying. You’ll learn key strategies for “reading” misbehavior to uncover its underlying needs and motivations. You can share these methods with teachers and parents to free them from “ignore-nag-yell-punish” cycles and senseless power struggles. Discover powerful techniques to divert and reduce hostility and revenge in oppositional, predatory, violent adolescents and young adults. 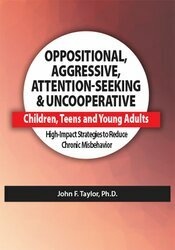 You’ll be able to introduce pre-social adaptive behaviors that develop conscience and satisfy their unmet needs that trigger misbehavior. Demonstrate at least 4 clinical interviewing strategies to address resistance, reduce defensiveness and build trust with clients. Incorporate effective interventions to help clients express anger in a constructive, healthy manner. Teach caregivers behavioral strategies to increase compliance and cooperation at home and school. Assess the client’s worldview and interpret the meaning behind maladaptive behavior in order to develop an individualized treatment plan. This course is offered for .55 ASHA CEUs (Intermediate level, Professional area). **ASHA CEUs are available on this course from 03/01/2019 to 02/29/2024. PESI, Inc. will submit ASHA CEU Requests to the ASHA CE Registry on a monthly basis; ASHA CEU Requests received before 03/01/2019 or after 02/29/2024 cannot be reported.